NYC jewelry is very diverse. You can find lots of designs and there is a whole universe out there. However, there are still some iconic pieces that you need to have. Just like your little black dress, these pieces will always be in style. No matter how many New York jewelry stores you check out, keep in mind that your jewelry collection needs to feature these must-have pieces. Curious to find out what NYC jewelry pieces have made our top? Read further to discover. Before we get started, let’s talk a little bit about what an essential jewelry piece is. 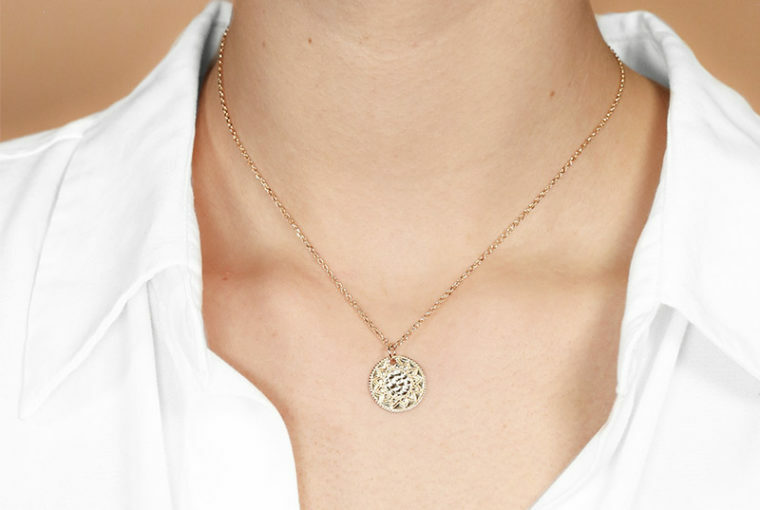 Many women believe that essential pieces are subtle, delicate and minimal. This couldn’t be further away from the truth. An essential jewelry piece is a design which you can wear anytime, whether you go to a business meeting or to a cocktail party. It has a beautiful design, grabs attention and helps you obtain a unique look. This being said, let’s see our top pick for must-have NYC jewelry pieces. We are going to start with the earrings as these are the favorite jewelry pieces for many women. They are also the most diverse and though we love having so many options, sometimes, we may not know what to choose. Don’t worry, we are here to help. As we said before, the essential earrings need to be versatile but also attention-grabbing. These fantastic pearl drop earrings are the NYC jewelry pieces that you need to own. They have a perfect size, not too small and not too big. You can easily match them with a sharp suit and wear them to work. Going to a formal event? Great! Put your hair up, wear your favorite elegant gown and match these lovely pearl drop earrings with a pearl necklace or pendant to get an elegant look. And what about jeans & T-shirts? It’s no coincidence that these pearl drop earrings have made our must-have NYC jewelry pieces list. You can easily match them with your white sneakers, graphic tee and ripped jeans. In fact, we can’t think of any look these earrings would not be suitable for. And that’s because they are amazing so go ahead and add them to your NYC jewelry collection. Raise and shine because the sun is up. Or, rather, hanging from your neck. We know you would expect a beaded necklace to be on our list of must-have NYC jewelry pieces, but we thought of something better. 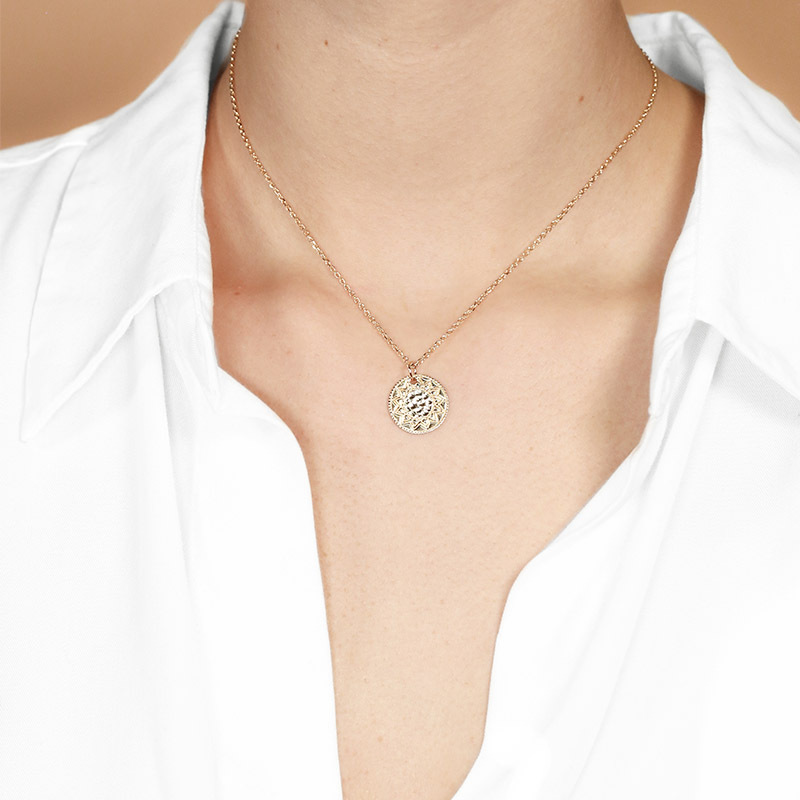 This fabulous gold pendant necklace featuring a sunflower design will work for any outfit. Because of its ideal length, it will look great with turtlenecks and deep-V necklines as well. Want to wear it with a work shirt and tailored trousers? Yes, please. Switch your work outfit for your little black dress, but keep this necklace on to get an irresistibly hot look. And if you are feeling in the mood for a hoodie and large pants you can wear this necklace as well. Due to its fabulous design, you can also match it with many other NYC jewelry pieces. It looks great with hoops, studs and even stacked bangles. If you want to go for a statement look, just layer your necklaces. Wear this neckline along with a gold choker and a coin lariat to create a fashionable look. Since we are talking about must-have NYC jewelry, it’s time to have that discussion about the cuff. The gold cuff, to be specific. Most women think of big, chunky bracelets when they hear about cuffs, but this isn’t always the case. A cuff bracelet is bigger than a bangle, but it doesn’t have to be chunky. 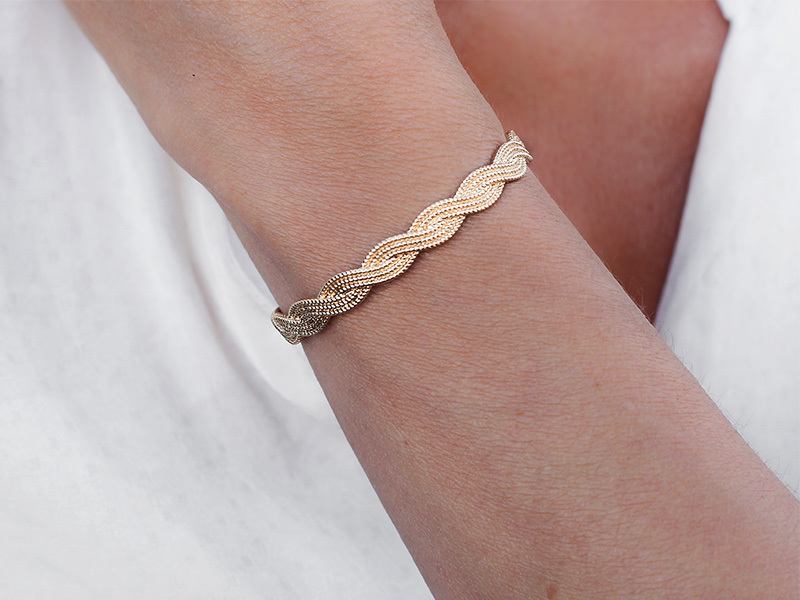 For example, this lovely woven gold cuff bracelet has the perfect size which allows you to wear it at work, to a night out with your friends or even to a formal event. It has a feminine and classy look that goes great with suits, chiffon dresses or even boyfriend jeans. It doesn’t get in the way and it looks stunning on your wrist, so go ahead and add this NYC jewelry piece to your collection. Oh, and the best part is that you can also stack it with other bracelets if you want to get a layered look. All you need is a couple of gold bangles and you get a statement look in no time. Sometimes, gemstone rings can clash with other jewelry pieces. If, for example, you are wearing a sapphire ring, you can’t also wear your favorite pair of emerald earrings. This is why no gemstone ring has made our list of essential NYC jewelry pieces. Instead, we have chosen an all-metal design that you will instantly fall in love with. 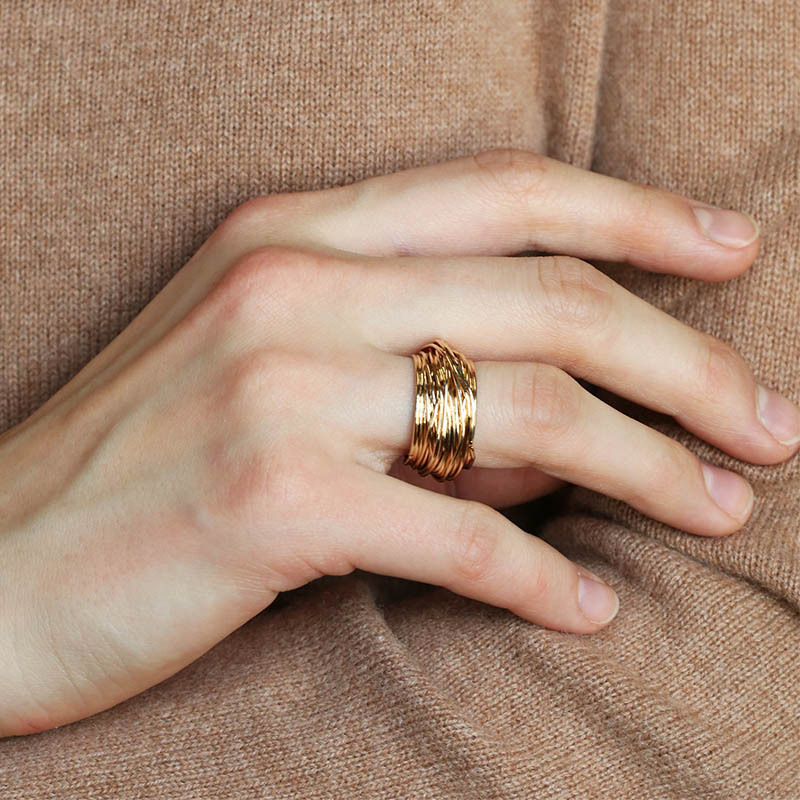 This gold textured ring has a unique design. It grabs attention but it is versatile enough for you to wear it to work, when you are out dancing or when you go to a formal gala. Because of its woven design, it has a stacked vibe and it is very fashionable. This is our list of essential NYC jewelry pieces. If you want to find out more about jewelry styling, read our other articles as well. To buy any of the pieces featured in this article, visit Ana Luisa online jewelry shop. In our New York designer jewelry collection you will discover limited-edition unique pieces that will become the stars of your jewelry box.